Beginning as a brewpub, Echigo was Japan's first brewpub. They have led the industry for 20 years, producing quality craft beer and bringing the taste of good beer to Japan, and now hope to bring these excellent Japanese beers to beer fans across the globe. This rice lager made with Niigata Prefecture's celebrated Koshi Hikari rice has fine and persistent carbonation and a clean, crisp flavor from the super-premium rice. 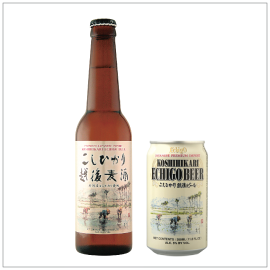 Using the Decoction method, Echigo Brewery maximizes the flavor from the rice and malt.